. Seven Gods of Good Luck 七福神 Shichifukujin　. The Shichifukujin are an eclectic group of deities from Japan, India, and China. Only one is native to Japan (Ebisu). Three are from India (Daikokuten, Bishamonten, and Benzaiten) and three from China (Hotei, Jurojin, and Fukurokuju). The mystery of number seven has enraptured the Japanese as well. Ancient Japan was founded around seven districts. In Japanese folklore, there are seven treasures and seven deities of good luck (the topic of this story). Japanese Buddhists believe people are reincarnated only seven times, and seven weeks of mourning are prescribed following death. The list goes on and on -- the seven ups and eight downs of life (Daruma san, you remember), the seven autumn flowers, the seven spring herbs, the seven types of red pepper, the seven transformations, and the popular 7-5-3 festival held each November for children, in which special Shinto rites are performed to formally welcome girls (age 3) and boys (age 5) into the community. Girls (age 7) are welcomed into womanhood and allowed to wear the obi (decorative sash worn with kimono). Link about these seven deities. 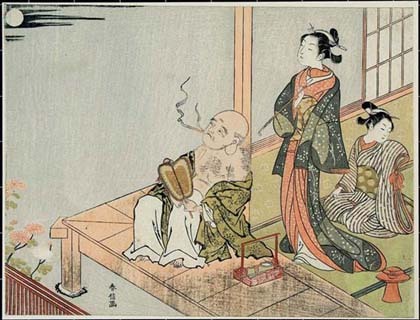 The belief in the seven gods of good luck may have started in the Kamakura period as the belief in Ebisu, who had been introduced from India together with Daikoku and Benten. 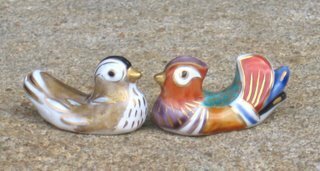 In the Muromachi period, these three were revered together. Next from India came Bishamonten and then from China Hotei, Fukurooju and Juroojin. These seven gods are gathered in one common pilgrimmage for the New Year. At the beginning of the Edo period Tokugawa Ieyasu started the first set of seven temples from Temple Kanei-Ji in the Ueno area. During the more peaceful time of the seventh Shogun Yoshimune it turned into more of a festivity and tourism and spread over all of Japan. Nowadays, people visit these temples often as a kind of hiking entertainment or stamp ralley, but it never lost in its popularity. He is the god of contentment and happiness. 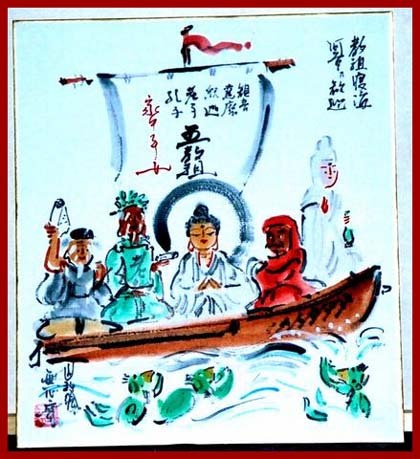 He is the only one of the seven deities who is modelled after a real person, the Chinese Zen Priest Kaishi (Ki-hi) , who lived around 900 in T'ang China in the Mountain Temple Shimeizan. He wandered around in the country, carrying his few belongings in a big sack. He freely shared his things with people in need and the local children all loved to be around him. In his free way of life he teaches us to cultivate a mind free of worry and a heart free of wishes, since these are greater treasures than anything else you can carry around in this world. He is known to be an incarnation of the Bodhisattva Maitreya (Miroku Bosatsu) the Future Buddha. An old, bold man who carries a huge bag. His robe is open and shows his huge belly. Sometimes he holds a Chinese fan (uchiwa) in his hand. Many illustrations show him resting on his huge bag. 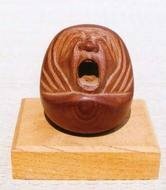 He is very often represented in Bizen Pottery. Here you can see him carrying the wishfulfilling jewel and with a child at his side, as quoted by Darkchilde.
. takarabukuro 宝袋　the Treasure Bag of Hotei . 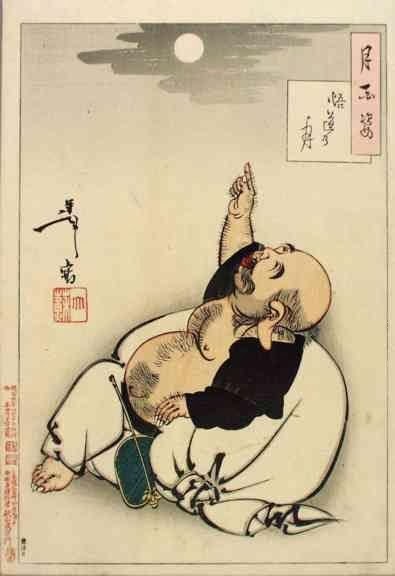 Hotei is thought to be based on a Chinese monk named Bu-dai, who became identified as an incarnation of Miroku, the Bodhisattva of the future. The statue is kept in the Tenno-den (Heavenly Kings Hall) of the temple. Here is another version of his legend. He is the god of happiness, laughter and the wisdom of contentment, and is the patron of the weak and children, fortunetellers and bartenders. 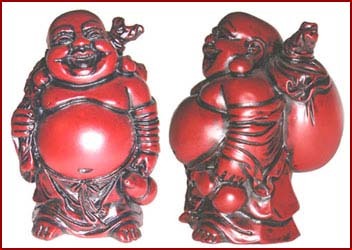 Hotei is distinguished by his body of generous proportions and round stomach exposed beneath loose robes. 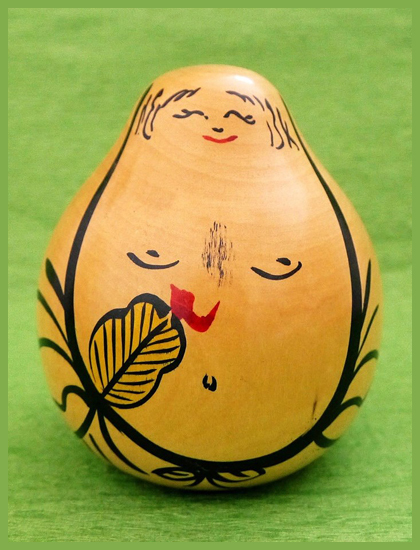 His big belly is a symbol of happiness, luck and generosity. On his back he carrys a huge linen bag containing precious things and gifts of good fortune, including children. He also holds an uchiwa, a flat fan of Chinese orgin used by ancient chieftains as an emblem of authority and wish granting. He may sit in an old cart drawn by boys, as the Wagon Priest, and can be compared with the Buddhistic Mi-lo-Fo. 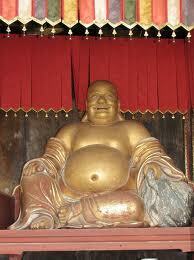 In Chinese Buddhism he is known as Budai, the Loving or Friendly One. He was a wandering Chan Buddhist monk who lived in the ninth century. At his death between 901 and 903, he recited a poem that revealed to the world that he was in fact the Bodhisattva Maitreya in disguise. Maitreya, Chinese Buddhists believe, is the future buddha, who will return to the world and bring innumerable individuals to salvation. 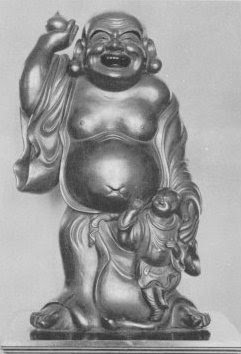 This concept of hope for the suffering, combined with Budai's pleasing, human features, made him a most popular Buddhist deity. It was not until the sixteenth century that he was canonised as the sixteenth and last Chinese bodhisattva. According to Chinese legend he carried a sack of candy to give to children. 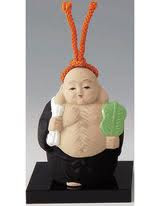 He is sometimes worshipped as a god of good luck and prosperity. He is always represented as very stout, with the breast and upper abdomen exposed to view. His face has a widely grinning or laughing expression, and he is also known as the Laughing Buddha. He stands in the first hall of the Buddhist monastery. Because of his constant good nature, he has become the symbol of philosophical contentment. 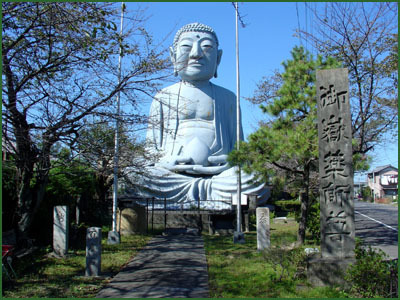 Visible from the train between Hotei Station and Konan Stations on the Meitetsu Inuyama Line, the 18m high Hotei Buddha was erected in 1954 by successful local Moxibustion practitioner, Maeda Hidenobu. The Hotei Buddha is popular with travelers on the train line, and with photographers, particularly in spring, when the Buddha is surrounded by clouds of pink cherry blossom. 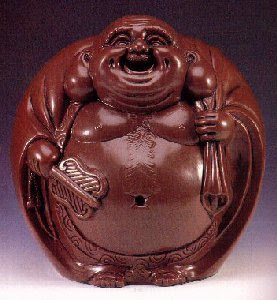 The name Hotei actually means "cloth bag" or "glutton." A legend has it that if a person is to rub his belly, it brings forth wealth, good luck, and prosperity. Read more about this deity. 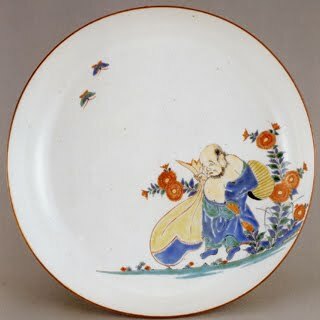 Hotei on a plate made by Kakiemon, Arita. Read a lot more here in an essay by Jennifer Polden. Clay bell with Hotei, click for more ! votive tablet with Hotei, click for more !
. WKD : Hotei aoi ほていあおい Common Water Hyacinth . Daikokuten, Bishamonten und Benten sind indische Gottheiten, Ebisu ist eine rein japanische Gottheit. Hotei und Fukurokujuu sind chinesischen Ursprungs. Seit der Muromachi-Zeit besonders von Geschäftsleuten verehrt. Sechs männliche und eine weibliche (Benten) Gottheit. Entweder alle in einem Tempel aufgestellt oder für jede Gottheit ein eigener Tempel, die in den Neujahrstagen alle abgepilgert werden müssen. In einigen Tempeln befinden sich sieben besonders große, auffallend geformte Natursteine, welche die Gottheiten darstel~len. Oft zusammen auf einem Glücksschiff (takarabune) dargestellt, auf dessen Segel das Schriftzeichen für "Schätze" (takara) steht. Dieses Bild ist besonders am Neujahrsfest glückbringend. Eventuell aus dem alten Brauch des "Siebenmal Anbeten" (nanado mairi) entstanden, bei dem zum Gionfest in Kyooto an einem Tempel sieben Mal hintereinander ein Gebet gesprochen werden mußte, damit es wirksam wurde. Die Zahl "SIEBEN" ist seit alter Zeit mit Glück verbunden. Es gab auch den Brauch, sieben Statuen des Hotei nebeneinander aufzustellen. In der Edo-Zeit am 2. Januar legte man sich ein Bild der Glücksgötter unter das Kopfkissen, um einen guten ersten Traum im neuen Jahr zu haben. Die meisten Gottheiten wurden bei den Ten bereits besprochen, siehe dort. Chinesischer Zenpriester Kaishi (Kihi) des Tempels Shimeizan; lebte in der T'ang-Zeit. Wanderte bettelnd durchs Land, spielte mit den Kindern, trug seine Habe in einem großen Sack mit sich herum. Inkarnation des Miroku Bosatsu. Er lehrte, daß ein Geist frei von Sorgen und ein Herz frei von Wünschen wertvoller sei als alle weltlichen Schätze dieser Erde. Alter, lachender, kahlköpfiger Priester-Schelm. Offene Kleidung, mit herausragendem dickem Bauch. Mit großem Sack, auf dem er oft ausruht; in der Hand einen chinesischen Fächer.
. Matsuo Basho 松尾芭蕉！ . How much I desire ! I want to have it ! - the autumn moon and the cherry blossoms . . .
symbols for all the good things of the four seasons. Once the leader of a group of thieves was Tengubei. They went into the home of 左近丞 Sakon. When Daikokuten hit the head of Tengubei, it slipped back into the body. 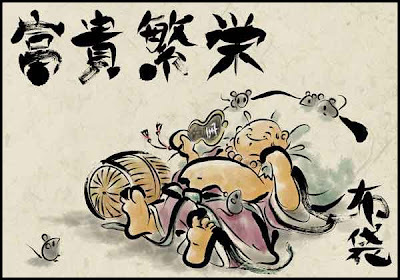 Ebisu Saburo swung his fishing rod and hit the nose of the thief きつね兵衛 Kitsunebei. Hotei was practising Zazen and did not make a move. The thieves run away in awe. The 福の神 Gods of Good Luck held a banquet with music and dance.